Viewing and animating multiple profiles/HGLs simultaneously can aid in the analysis and presentation of many modeling projects. One prime example is in dual drainage (major/minor) system analysis, where the simultaneous plotting of both major and minor system HGLs allows the user to see the dynamic interaction of stormwater between both systems. 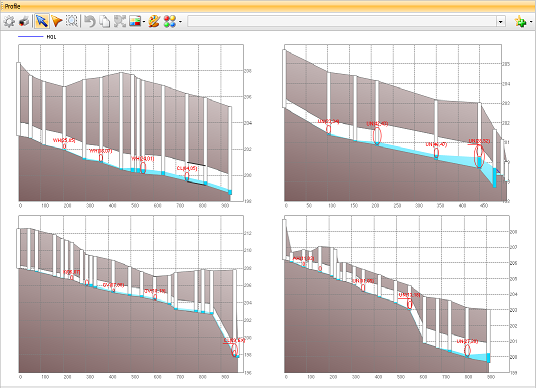 We are happy to announce that the latest update to PCSWMM (version 3.8, released July 5, 2010) supports plotting multiple HGLs in the same panel, with support for copying/printing and exporting the multiple profile layout to AutoCAD. While many applications can tile windows to show multiple plots, PCSWMM draws the profiles in the same plot area, and provides flexible layout controls for the position, orientation and number of profiles. This simplifies the production of compelling multiple profile plots for reports, large scale printing and exporting to CAD (more on this later), as well as saving screen real estate normally taken up with multiple window frames. Plot style and labeling can be set for all plots simultaneously. A single slider controls the animation of all HGL's and turning on scenario mode will display multiple scenario HGLs on each profile. Like usual, all plots allow fully dynamic interaction, including mouse selection and drag-and-drop editing, zooming and panning, animating observed time series along with computed HGLs, EGLs, observed depths and more. Export profiles to AutoCAD, Microstation, etc. Profile and HGL plots can now be exported directly to various CAD and open standard file formats. The components of the profile (junctions, conduits, HGL, ground surface, etc.) are all tagged appropriately in the exported format, which allows for easy identification and rendering third party software. Other nice additions to the profile panel include an overview frame for reference when a profile is zoomed in, and improved mouse wheel support for zooming and panning the profile (mouse wheel panning up or down the profile is enabled when the Shift or Ctrl key is held down).